Would you build your house on quicksand? So why would you build your website on an unstable WordPress theme? We’ve found that it can be hard to tell which themes are reliable and stable until well after your site is already built. That’s why we’ve curated the most RELIABLE WordPress themes for YOUR Website in this article. If you build your site on the wrong theme, then you’ll start to notice strange glitches appear on your site. Text or images become misaligned, buttons and other features might stop working, and sometimes the site might even become infected with malware! Such mistakes can be costly. Crappy WordPress themes not only make your site look ugly, but they also leave the door wide open for the bad guys. With an entire ocean of WordPress themes out there, it doesn’t make your work of choosing any easier. Two of the biggest WP themes repositories, WordPress.org and ThemeForest, have more than ten thousand themes between them. With so many themes out there, making the right choice can feel like pulling the lever on a slot machine at casino and just hoping for the best. You don’t have to play Russian roulette every time you go out hunting for a WordPress theme though. We’ve taken the time to curate the most stable and reliable WordPress themes of 2019. That’s not all. We also tell you which themes you should avoid like the plague. 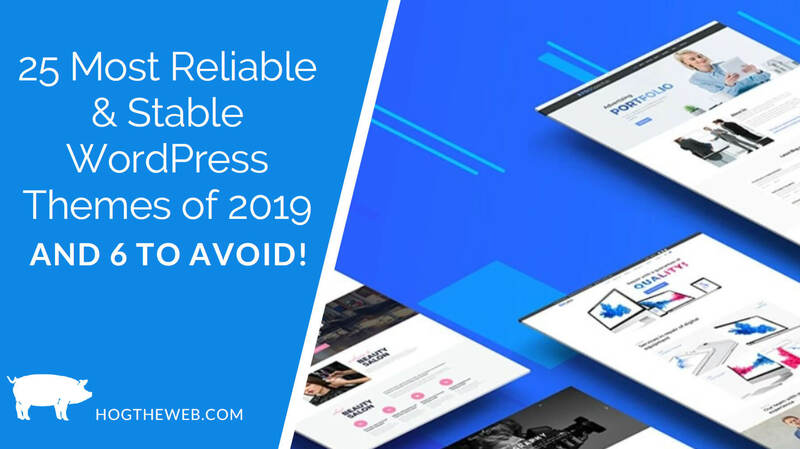 Grab your favorite beverage and let’s review the most stable WordPress themes of 2019! That’s not what makes Divi one of the best themes though. Divi has been around since 2013, and is built and supported by the renowned Elegant Themes team who don’t cut corners. And because DIVI is used on over one million websites today, and is Elegant Themes flagship theme, you can be sure they will continue supporting the Divi theme as their top priority for the long term. Another reason Divi sites are more stable than others is because Divi is both a Theme and Page Builder. Most themes and page builder plugins operate as independent elements of your site, however their functionality oftentimes overlapping when it comes to assigning fonts, styles, colors, and layout of your site content. This overlap in the function of a sites Theme and Page Builder often causes conflicts and issues. However, since the DIVI theme integrates these two elements together, you don’t run into these common conflicts and issues. DIVI is a stable and multipurpose responsive theme that’s free from all the bugs of many other powerful WordPress themes. It’s a premium theme, so you will have to pay for a license, however they offer a lifetime license option so you can just pay once to ensure you’ll get updates and support for life! A best seller, stale, reliable, and easy to use. The Avada theme is one of the most popular WordPress themes and page builders available on the market. It is a multipurpose theme, much like Divi, suitable for just about any website. It doesn’t matter if you’re setting up a pet blog or a hosting business website, Avada does it all. Once you buy Avada, you’ll never have to hire a designer or enroll in a programming course. All you need to do is drag a few elements here, push a margin out there, and presto! You have a website. Pretty nifty huh? The business end of Avada’s theme, the Fusion Core, makes Avada the most reliable and stable theme on the market. And, like Divi, it’s both a theme and page builder combined into one. This makes for a more stable configuration then a separate Theme and Page Builder. With a focus on responsiveness and versatility, it’s not a wonder that Enfold is one of the most popular WordPress themes around. After a Google update penalized websites for lacking mobile support, Enfold users were the few lucky ones to escape a net wide penalty. The theme offered mobile support as far back as 2016 with Design Bolts noting that it was the best SEO optimized WordPress theme available then. They are yet to disappoint. Installing the Enfold theme on your site puts you on the fast track to better ranking. Kriesi, the guys behind Enfold theme provide an advanced layout editor, pre-defined layouts, and tons of other features to help you out rank and out design your competitors. While SEO is not magic, lots of websites running Enfold theme rank on the number one spot on Google. The Genesis Framework is another WordPress solution for folks looking to create responsive and SEO-friendly sites. It’s not a theme in the traditional sense. Rather, it is a foundation WordPress users use to create search-engine-optimized sites quickly. The Genesis theme is for more experienced WordPress developers looking for an easy way to rapidly develop custom themes. That doesn’t mean complete beginners can’t enjoy the versatility of the Genesis Framework. StudioPress has numerous guides to help you get up and running with Genesis. If you put in the effort, you’ll be in control of one of the most robust WordPress frameworks that integrate SEO, security, and performance features in a single place. The guys behind the Salient theme were not exactly subtle when coming up with a name. They knew their theme would turn a few heads, so why not call it Salient? It is immediately noticeable, has all the features you’d want in WordPress themes, and most importantly of all it is easy to use. It is one of the most stable WordPress themes with a huge options panel that includes the ability to style buttons, form styling, and what’s going to be a favorite for most online business owners, the ability to style their Call to Action buttons. How cool is that? You can also toggle page animations and transitions on or off, as well as getting access to a handy drag and drop page builder provided through the Salient Visual Composer plugin. Basically, Salient has all the good stuff every a stable WordPress theme has. What makes Salient an attractive theme is its portfolio custom post type. For folks looking to get in on the services market, having a rocking portfolio can be the difference between a continuous flow of gigs and broke town. Salient’s portfolio custom post helps you create a stunning portfolio quickly, regardless of your service industry. Another hugely popular theme in the Elegant Themes staple is Extra. As the name suggests, you get lots of extras with this theme, and no one’s complaining so far. It’s a magazine theme, so it might not be suitable for all niches, but it comes bundled with Elegant Theme’s Divi Builder. The visual page builder lets complete noobs create glossy magazine-style websites in minutes through its drag and drop functionality. That’s not all though, the theme works with WooCommerce, uses Elegant Theme’s perpetual updates mechanism, and it is completely customizable. When a WordPress theme claims it is the most responsive multipurpose theme, it better live up to its word. BeTheme does. BeTheme comes with over 150 ready to use layouts ready to install in a single click. Each of the layouts comes with a different presentation to give your niche website a unique feel and look visitors will appreciate. The layouts are compatible with a single page site, portfolio, business, legal, and entertainment websites, to name a few. You also get access to the Muffin Page Builder and its nifty graphical interface for building landing pages. The Visual Composer plugin that comes with every purchase of BeTheme is really handy for budding webmasters looking for a high stability WordPress theme. Easily one of the most customizable themes on the list, The7 boasts of more than 1,000 theme options. It also offers the best support for some of the essential WordPress plugins including WPBakery Page Builder and the Ultimate Addons plugin. What makes The7 a great theme is not all the bells and whistles though. It is one of the friendliest themes on the market. You can easily customize it even if you’re just starting on WordPress. The7 captures the spirit of WordPress being extremely flexible and easy to use. If you’re a newbie, take The7 for a spin. You’ll never look back. UpSolution outdid themselves with the Impreza theme. Not only is it extremely customizable and responsive, but the theme also includes a Visual Composer and Slider Revolution premium plugins to make WordPress management easier. Setting up the theme is pretty simple with the bundled demo content for various sites. With Impreza, you have complete control over every aspect of your site including content styling, color schemes, site headers and footers, and lots more. That’s all fine and dandy, but most premium themes offer all these. So why would you go for the Impreza theme? Well, the parallax affects you get with Impreza are next to none. When creating a new page, try out the parallax effects for the header background image. It’s a sure way to draw the right kind of attention to a new site. Flatsome is the unbeatable WooCommerce and business theme available today. If you’re looking to set up a WordPress shop or company website, Flatsome has you covered. With tons of tools to create a responsive website with amazing user experience, the theme offers a seamless introduction to WordPress ecommerce. You get access to a responsive page builder so that you can quickly get your site up and learning without any coding skills. If you’re looking for a mature and stable WordPress theme for your ecommerce store, Flatsome is your only option. Looking for a stunning website? If you are, then the Bridge WordPress theme is perfect. Created with the creative kind in mind, the Bridge theme opens a whole other side of web design. It is retina ready meaning you can take advantage of everything CSS3 has to offer. That’s not all though. What makes Bridge one of the most stable reliable WordPress theme is the awesome support for Google Fonts, interactive elements, and unlimited options. Like other premium themes, Bridge comes with a page builder, unlimited customization, and 100% responsive. All features bundled in the theme are user-friendly, so you don’t need to hire a designer to get your site up and running. Yet another multipurpose WordPress theme you’ll want to use on any site, Uncode differentiates itself by offering lots of built-in homepage templates and a 1-click demo importer. It’s a friendly theme for beginners by opening up all its functionalities to folks with the least experience with WordPress. Lots of themes claim to be user-friendly, but Uncode takes it to the next level. Undsgn, the creative WordPress developers behind the theme, make it possible for folks without the slightest clue about WordPress to take complete control over their sites by providing a Visual Composer, pre-built Homepage designs, and support for any third-party multimedia content. You don’t have to be a WordPress guru to use the Uncode theme. Simply install it customize the site to your hearts desires using the bundled page builder. However, you’ll have to set the memory limit to at least 64MB on your web server for the theme to function correctly. Jupiter is for those who have basic-to-intermediate WordPress skills. For beginners, the theme offers a visual editor to manipulate page elements like fonts, headers and footers, styles, and fonts. If you want to get under the hood of your WordPress installation, Jupiter gives you unfettered access to the WordPress core, making it possible to develop even the most complex of sites using WordPress. What makes Jupiter a stable WordPress theme is not its sleek appearance. Rather, it is the dozens of custom templates in six niches. The theme’s update mechanism makes it easy to migrate to new WordPress instances without changing any code or requiring any end-user interaction. tagDiv, the guys behind the Newspaper WordPress theme sought to provide a complete solution for folks looking for a magazine-style website. They came up with a framework supporting not only news sites, but also publications and digital magazines sites. Newspaper is a fully customizable and responsive WordPress theme with more than 50,000 downloads on ThemeForest. What makes Newspaper different from other magazine-style themes? For starters, Newspaper provides built-in ad integration. The ad integration allows you to monetize your site from the get-go by placing ads on the headers, sidebars, footers, and within articles. You also get access to premium plugins like Visual Composer and Slider Revolution. When other creative multi-purpose WordPress themes fail to impress, almost everyone goes for TheGem. The not-so-aptly named theme promises a multi-purpose toolbox geared towards high performance and versatility. Most creative WordPress themes are not SEO optimized, and TheGem seeks to fill in that gap. The theme features an ultra-modern and minimalistic design spawned to help professional, and beginner web designers realize their creativity. You get tons of customization options, a Visual Builder, and lots of other features that come with premium themes. The six pre-defined sidebars come in handy when you want to change the typography of your site. You also get access to 15 custom widgets as well as a beautiful and fully customizable slider. What makes TheGem a stable WordPress theme is the support for popular plugins including NivoSlider, Revolution Slider, and LayerSlider. Premium plugins like TheGem Import, TheGem Theme Elements, and Visual Composer are also included in the theme. Fast, responsive, translation ready, and search engine optimized, the Phlox theme provides the building blocks for a modern website. The lightweight theme comes with 19 demo sites you can import with a single click. You also get Visual Composer and a SiteOrigin, elementor, and WOBackery page builders, both standard plugins bundled with premium themes. That’s all fine and dandy, but what makes Phlox unique? What makes it a stable WordPress theme? For starters, Phlox is WooCommerce ready. You can easily create a WooCommerce storefront without messing around with any code. You won’t have a problem complying with the GDPR guidelines when you opt for Phlox with its advanced cookie management system. There are more than 80 ready to use templates to help you create your dream website in minutes. Start customizing every pixel of your website with Phlox today. No matter the kind of site you want to build, Porto has plenty to offer. The multi-purpose WordPress theme focuses on ecommerce stores, but it also doubles as a complete solution for business and personal website. Porto has a library of dozens of demo websites to help beginners and professionals create professional WordPress sites. Joining the Porto network also gives you access to dozens of free WordPress themes and plugins. That’s not the main reason you should install the theme though. What makes Porto a reliable WordPress theme is its header customization options. While other websites only allow rudimentary header customizations such as changing the background image, Porto doesn’t restrict you. There are well over 18 header designs to help make your website truly unique. You can even change the headers of the demo sites from the theme options in the control panel. Several premium plugins including a page builder and the Master Slider premium plugin are part of the Port ecosystem. You have every tool to do all the heavy lifting, so you don’t have to learn how to code. Most things try to be a lot of things. Search for multipurpose WordPress themes, and you’ll get an idea. You’ll get WordPress themes that can be used to make just any type of website. Not WoodMart though. The folks behind the theme sought out to develop a comprehensive solution for users seeking to start WordPress storefronts. WoodMart specializes in eCommerce. It does such a good job that it was voted as one of the best WooCommerce themes of 2018. All the widgets, shortcodes, sliders, and custom functionality are made for eCommerce. Because the security of ecommerce store is of paramount importance, the guys behind WoodMart frequently roll out security updates. They also have one of the most responsive customer support teams. If you get unstuck using WoodMart, contact them, and within a day, someone will help you out. That’s not all though. The full AJAX support for pagination, links, and widgets help bump visitors to customers seamlessly. While WoodMart offers a unique customer experience, developers from both ends of the spectrum will love the ease of customization. Whether you use the page builder or go digging under the hood, WoodMart lets you take complete control over your online store. WPExplorer, the folks behind the Total theme, brought all their experience of making WordPress themes and plugins to the making the Total theme. As you’d expect, Total is a fully responsive and multipurpose theme dedicated to customization. There are well over 500 styling options, 80 plus builder modules, and 40 pre-made demos to speed up the creation of your WordPress site. While we can bet you won’t use each of the options, it doesn’t hurt to know that you can change the appearance of your site with a click of a button. You don’t have to understand the dark art of coding to customize the Total theme. There’s a visual page builder for that. Just click on where you want to change, drag and drop some elements, and PRESTO! Your WordPress site is open for business. That’s not all though. Total lets you create a custom login page, which is especially useful for websites with multiple authors. With several custom post types like staff, testimonials, and portfolio, Total lets you take full command of the content on your site. You can use Visual Composer to display custom post types using special elements. You wouldn’t expect a strong theme from folks who’ve never made any other WordPress theme or plugin. Hogash, the team behind the Kallyas theme, is an exception though. Although Hogash is known for its Joomla and HTML templates, they impressed everyone with their Kallyas theme back in 2013. The theme continues to gain more popularity with over 40,000 sales. The powerful and responsive theme has a flexible front-end page builder to access the numerous customization options. You also get access to more than 50 pre-made demos, all of which live up to the name Kallyas, which means beauty in ancient Greek. Hogash sought to enable users to brand their sites with the least amount of effort. They spent quite a bit of time making the header customizable and flexible. Kallyas supports unlimited custom sub-headings designs. You also get a Side Header Addon that replaces the default header with elements like logo image, navigation menu, a search bar, and tons of other elements. What makes Kallyas an eye catcher though is the responsiveness and support for retina devices. The theme also comes with a child theme. Advanced users can make modifications to the child’s theme code without messing up the main theme files. All the functionality, plugins, and goodies packed into Kallyas are only a click away. The one-click installation wizard walks you through the installation process and even checks if there were any problems with the installation. Ok, so not everyone will venture into the education niche. That doesn’t mean the top-rated education WordPress theme doesn’t deserve a mention in the list. EDUMA was voted as the best education theme of 2018. ThimPress put a lot of work into the theme. EDUMA is not only responsive, but it is also flexible, packed with niche specific functionalities, and even provides the tools you need to create your very own online learning platform. You don’t need to be an advanced user to make full use of all features provided by the theme. There’s a visual page builder for that. So if you’re looking for a stable WordPress theme for a school, check out EDUMA. Focused on the profitable real estate niche, Houzez brings responsiveness, functionality, and unlimited customization options to realtors looking to make a name for themselves in an ultra-competitive market. Favethemes included lots of tools to help you hit the ground running including property page templates, front end estate submissions, an advanced search function, and of course integration with the most useful WordPress options. The stable WordPress theme for realtors supports the elementor page builder, Visual Composer, Contact Form 7, MailChimp, PayPal, stripe, and iHomefinder. LeadEngine does what its name suggests. It helps turn visitors into potential leads. The fully responsive and highly customizable theme presents a sleek experience for visitors bumping them through every conversion step seamlessly. Whether you’re looking to make an agency, company, crowdfunding, or cryptocurrency website, LeadEngine has you covered. There are tons of pre-made demos ready you can easily customize. The premium theme comes with easy-to-use page builders and sliders. You also get lifetime free updates with your purchase as well as a child theme. The minimalistic design of the Authentic theme is its biggest appeal. It still manages to retain a sleek and modern design making it an attractive choice for blogs, portfolio websites, and even eCommerce storefronts. Like many premium themes, Authentic comes with lots of features and functionalities. With social media integration, email marketing support, and content management widget, Authentic improves your website’s visibility. The only downside to using the theme is the lack of support for drag and drop page builders. You’ll have to know your way around WordPress if you want to use Authentic. Those just starting out will have to hire a web designer. uDesign doesn’t restrict you with tons of pre-made themes. The developers of the theme provide an interactive, eye-catching, and modern framework on which you can build the next stunning website. With support for Visual Composer, you don’t have to be a coding prodigy to harness the power of uDesign. All you need is creativity. uDesign is also designed with SEO in mind and has one of the best support teams in the WordPress ecosystem. There you have it 25 of the most stable and reliable WordPress themes on the market. You might be taken back a little by the fact that every theme on the list is a premium. There’s a good reason for that. Free themes don’t come with the assurance of lifetime updates. Developers often abandon free themes meaning they don’t get security updates and improvements. With premium themes though, you’re guaranteed of lifetime support, making them the most stable WordPress themes. Now, let’s take a look at themes you should give wide a berth. While X theme comes with unique designs for just about any niche, it is not the best. The Cornerstone builder plugin that comes bundled into the theme is one of the buggiest page builders plugins. To begin with, the plugin likes to take frequent vacations. If you’re using it to make changes to the site and step away for a bit, when you come back and try to save the changes, you’ll get no response. You have to refresh the page, lose all the changes, and start all over again. The developers are yet to figure out a way to get rid of the frequent timeouts. At least they should make it such that Cornerstone notifies users when it goes on a timeout. If you ran into a problem with Cornerstone, you pretty much have to fumble your way to a solution. Because the X theme is dependent on the Cornerstone page builder, yet they are two separate installations and so are updated separately. This means that the X theme, and Cornerstone page builder can become out-of-sync and this can lead to unpredictable conflicts on your site. Even more, since the theme licensing is managed through Themeforest/Envato you must manually renew your license once per year or else your sites theme will become outdated and insecure. This trips up many site owners because most paid software allows for automatic renewal so you don’t have to worry about your license expiring. While it comes with all the bells and whistles of a viable premium WordPress theme, Medical-Link is plagued with problems. From users not being able to find their way around the dashboard to entire sites going offline by themselves, Medical-Link fails to live up to expectations. If you install this theme for your organization, be prepared to have disappointed clients. The contact form goes on the fritz every so often. You’ll have to know quite your way around CSS tags to get the appoint form working, and some plugins just won’t work with the theme. A theme that hasn’t been updated for the last three years is a sign of trouble. LIVE from designova masquerades as a premium theme. The lack of a modern UI, support for page builders, and non-existent documentation will have you pulling your hair out the moment you install LIVE. WebFactory makes some pretty nifty WordPress widgets and plugins. Themes are not their cup of coffee though. Their Netix premium theme is as bare as they come. It has no support for page builders, even though it claims to support the latest WordPress version. You can’t do a lot with the theme apart from pasting marketing links, and the last update was four years ago. Maybe the WebFactory figured they better stick to plugins and widgets. For a magazine-style theme, Camille does a good impression. Too bad the developers can’t imitate the workings of a good support department. Users who run into problems with their installation often have to jump through hoops to get much-needed support. Even though Camille got an update in 2019, it doesn’t seem like it has much of a future though. Only about 700 sites use the theme, and that number is not terribly encouraging in terms of future long-term support. If you don’t know your way around WordPress code, stay away from Education WordPress | Edugate. Trying to change something as simple as the header requires you to mess around with the files in your WordPress installation. Most of the time, you’ll end up crashing the site. Another thing you won’t like about Edugate is the lack of customization options. You’ll have to hire a professional to help you change elements on your site. Now that you know the most reliable (and least reliable!) WordPress themes of 2019, it’s time to get your site up and running. You already have an inkling of which theme best fits your niche by now, don’t you. Well, go ahead and download and install the theme. Even if you’re new to WordPress, get started today. We are here to make sure your site works flawlessly.